What do we want out of America’s schoolchildren? . . . out of America’s creationists? 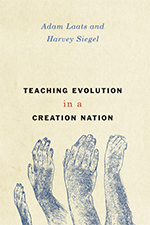 In Teaching Evolution in a Creation Nation, my co-author Harvey Siegel and I tackle these difficult questions head-on. Harvey and I review the historical and philosophical involved in America’s long culture-war battle over evolution and creationism. Historically, I argue, creationism (in most of its religiously inspired variants) has worked like other forms of religious and cultural dissent. Philosophically, Harvey reviews the tricky definition of science, as well as the most common objections to evolution education. In essence, we argue that the best way to understand creationism is as a form of educational dissent. By defining creationism that way, we can see some directions in which classroom policy should go. Most important, we argue that the proper aims of public-school evolution education should be to inculcate a knowledge and understanding of evolution. No creationist-friendly variants should be allowed in science classes as science. But dissenting students must be allowed and even encouraged to maintain their dissent. We can’t insist that students believe this or that about evolution. Not in public schools, anyway. We must insist, however, that students know and understand that evolution is the best scientific explanation of the ways life came to be on this planet. 1.) Is “belief” an inherent part of good evolution education? That is, should children in public schools be encouraged not only to know and understand certain facts about evolution, but to believe that evolution is really the best way to understand the roots of our species’ existence? 2.) Does it water down evolution education to allow dissenters to maintain their dissent, even in the face of overwhelming scientific evidence? 3.) From creationists’ perspectives, is it too much to agree that mainstream evolution science really is the best science? Will creationists agree that their ideas are more religiously inspired belief than legitimate scientific dissent? 4.) Can teachers in the real world walk this line between teaching facts about evolution and teaching belief in evolution? [Siegel and Laats] take two uncompromising positions: We must not compromise on evolution education and we must not compromise the rights of creationist students. Recognizing the fundamental principles at stake, their goal is to show how we can fully respect both considerations. The key is to distinguish understanding from belief. . . . [TECN] provides a scholarly treatment of a complex issue. The book is short and readable, however, reaching conclusions that can, and should, be implemented in all biology courses. And it may reassure creationists that their children will be treated fairly. Laats and Siegel manage to make this oft-discussed topic feel new and interesting…. The last few chapters are what set this book apart from most on the subject. Laats and Siegel firmly situate the evolution/creationism debate in the realm of culture, rather than science. Many evolution opponents worry that learning about evolution in school will challenge or insult their children’s faiths. The authors point out that this is not necessarily true. . . .Indeed, they argue, it is not the responsibility of science educators to make sure that students believe that evolution is true, but only to ensure that they understand how the process works. Belief, if it comes at all, will follow on its own. The authors acknowledge the new minority position of evolution opponents and explain that while they value multiculturalism and the protection of cultural minorities, “that doesn’t mean that their culturally specific beliefs should supplant the findings of mainstream science”(p. 95). highly readable historical overview of the evolution-creationism controversy. . . . Evolution is not just another scientific topic for many students. The fact that learning about evolutionary theory has cultural and religious implications for defining one’s identity makes the publication of this book important for secular and non-secular people alike. The authors make a strong contribution to public understanding of this controversy by approaching the issue from both historical and epistemological perspectives. it is unproductive to view the dispute between evolution supporters and evolution opponents as a dispute about science. Rather, the dispute between evolution supporters and evolution opponents should be seen as one part of the US legacy of religious dissent and cultural pluralism in public schools. If creationists and proponents of intelligent design are viewed as cultural dissenters with the same kinds of rights and responsibilities as other minority groups, then it is possible to think about how to create public school communities that are broad enough to include these dissenters on equal terms. While teachers have an obligation to teach evolutionary science to students, they also have an obligation to honour student autonomy, and to acknowledge the legitimacy of the deep interests of students in cultural identity, continuity, and community. . . . Even those who are not fully persuaded by the policy prescriptions that Laats and Siegel provide will profit from reading this historically and philosophical informed book. The topic is very important; the treatment is careful, accurate, innovative, and fair. Two thumbs up from me. accessible book with students. . . . The argument is optimistic, but not impractical. Like the book itself, the suggestion combines thoughtful logic with a generous respect for the varied participants in this ongoing conflict. . . . The book does an excellent job connecting seemingly isolated dots, explaining how cultural and intellectual realignments during periods of seeming silence on evolutionary education later helped to ignite serious conflict. New approaches to science and university education in the early twentieth century, post-war consensus among biologists about the legitimacy of the evolutionary synthesis, evangelicals’ increasing disillusionment with mainstream schooling and science in this same period, and the emergence of the concept of “intelligent design” all shaped the evolution battles that punctuated the twentieth century. . . . The book is a case study in how to write smart and short. It also offers some excellent examples of basic historical and philosophical procedure — chapter three is a model of how to approach seeming silence in the historical record. It is the perfect length for an introduction to the topic, and a welcome addition to the field’s literature. 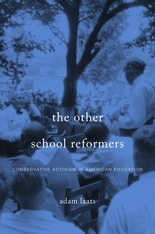 In this 2015 book (Harvard UP), I ask the question: what does it mean to be “conservative” about education? In TECN, I team up with philosopher Harvey Siegel to tackle a different question: Why are we still fighting about evolution? Tim Lacy on The Ink Is Dry! sheila0405 on The Ink Is Dry!